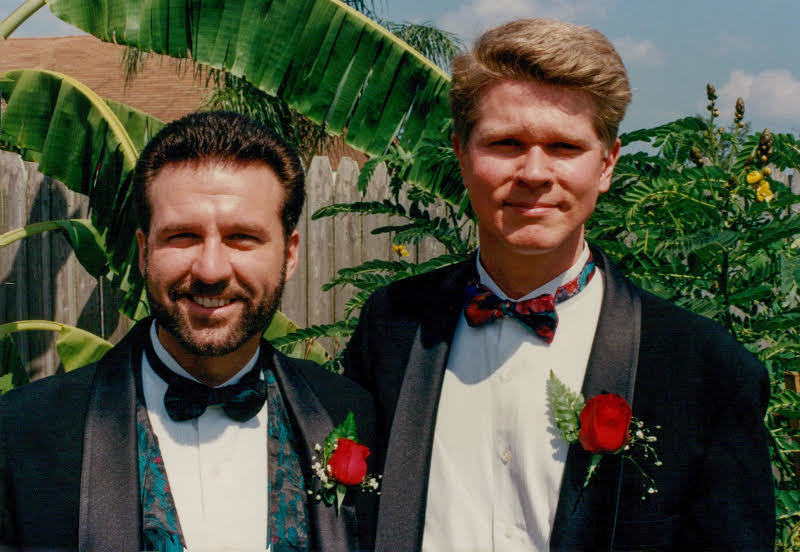 Nick Cardello, 54, and Kurt English, 52, met in 1992, and have been together for exactly 25 years. They're now married and living in Tampa, Florida. Cardello and English's 25th anniversary was significant for many obvious reasons, and one way the couple decided to celebrate was by attending the Equality March in Washington, DC, last weekend. Cardello told BuzzFeed News that in the days leading up to the march, he started sharing "more affectionate" photos of the pair on Facebook, including this throwback photo of him kissing English when they attended the March on Washington in 1993. This particular photo was significant to Cardello for personal reasons, he said. "[It] was a kind of second coming-out for us." "Most of [the photos] have been kind of generic — a lot of people get kind of sensitive to seeing images of gay men kissing, so I've always resisted posting them on social media," Cardello explained. This year, however, he decided it was "important for people to see that image." And last week, while they were in DC again, the couple decided to re-create that kissing photo — 24 years later in the exact same location on the National Mall. Cardello said he shared the photos to his social media soon afterward, as it was simply a sweet moment for their relationship. But he had no idea what significance and impact the photos would have for hundreds of thousands of strangers online. Cardello said he and English started getting messages and calls from friends telling them their photos had gone viral on almost every social media platform. This tweet, shared with the caption "it's just a phase," has already been retweeted more than 150,000 times. At first, Cardello said they were genuinely shocked and "amused" to witness their everyday lives being celebrated in this way. @tagyourheathen @AlohaKirstie GOD I LOVE THIS. "But when we started reading the comments and were tuned into what it meant to people ... that was really touching," he said. Cardello and English soon realized their simple re-creation photo meant a lot more than they realized to the younger LGBT generation on social media today. "What's interesting to see from the photos that have gone viral is the comments from the youth," Cardello said. 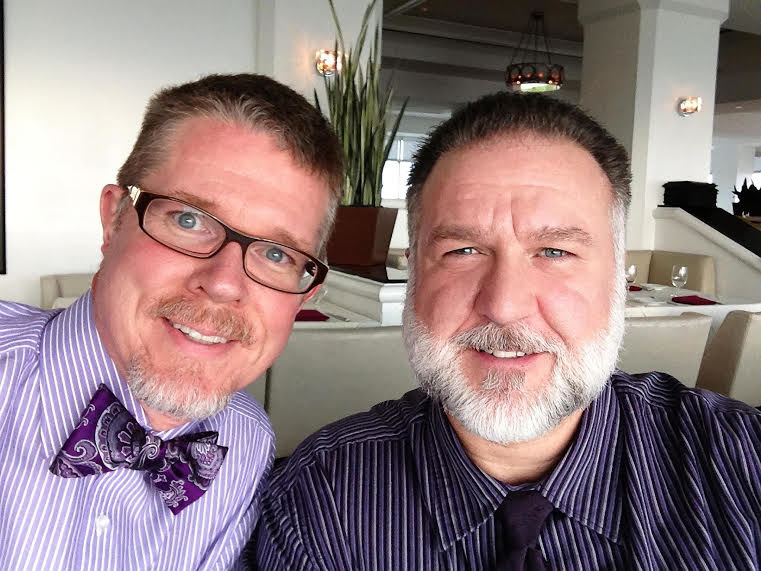 "They don't see many photos of gay couples getting old together." "They're tagging their significant others, saying 'this could be us'. That was really cute," he added. He further explained that most of his gay friends have been in relationships as long as they have ("30, 40 years, or longer"), so "it's nothing special, but for some people who are still learning to love, it's encouraging to them." @tagyourheathen @KyleKulinski They lasted longer than most straight people's marriages. Their photos have even inspired some candid conversations and admissions about homophobia. And Cardello is understanding. "People need time to adjust," he told BuzzFeed News. "I needed time to feel comfortable posting those photos, and people needed time to see them." @1Sale7 @tagyourheathen I have the right to post gay love as much as you have the right to post pointless hate. "I don't take it personally," he expounded. "The key point is that people need to come out." "Being more public, it becomes not such a big deal. My concern is with LGBTQ suicide rates. If they can't relate to people, they feel isolated. It's important for these images to be out there."